Blog How do I make a network connection to WordPress? How do I make a network connection to WordPress? To connect your account to WordPress, you will need the URL of your website or blog and the username and password of a user that has rights to post new content. Our system looks for a file call xmlrpc.php on your server. If this file is not accessible or cannot be found, the connection will not work. The easiest thing to try, is to enter the URL of your website. The system will try to locate the xmlrpc.php file from there. If that does not work, determine the URL pointing more specifically to your Blog and try to use that. To create a new WordPress network, open the the Manage Networks page from the home screen or settings menu. Under the Blogs section, click on the WordPress icon. 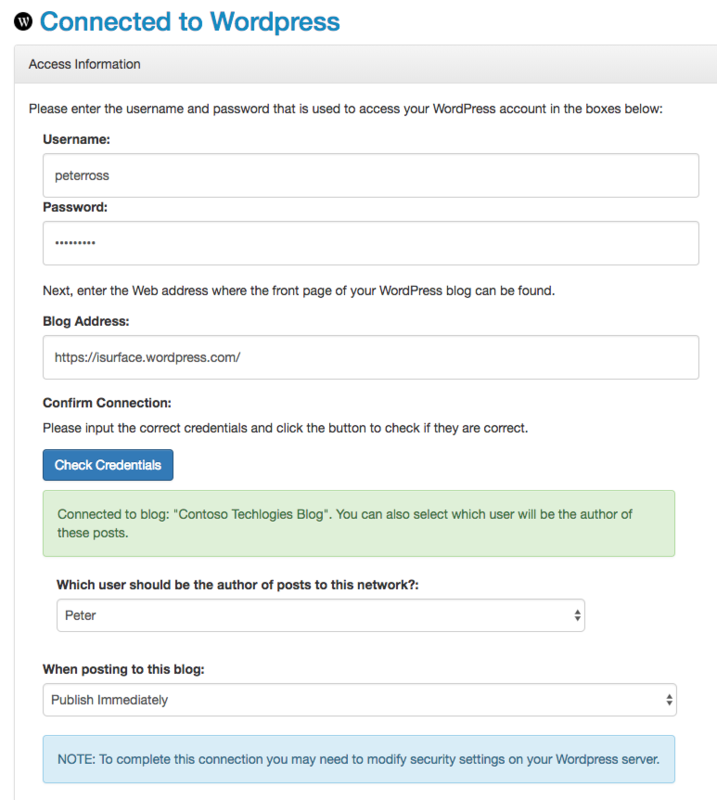 On the WordPress settings page (in the Access Information section), provide a valid username and password and the URL to your website or blog. Then, click Check Credentials. If the system is able to locate the xmlrpc.php file, a green box will appear indicating that the connection has been made. You can then select which user will indicated as the author of new blog posts. To post new blog articles immediately to your website or blog, select the “Publish Immediately” option. Otherwise, you can select “Save as Draft” to post content to your WordPress account and require a user to then login and approve the content before it is Published.